I was diagnosed in 02/2014 with stage 3A lung cancer. I started chemotherapy and radiation in April, finished the end of May. I had upper 1/3 of left lung removed along with dead tumor and 3 lymph nodes removed from front of lung. Now I'm cancer free. I'm 58 and I was diagnosed in August with stage 3 lung cancer; cancer in the left lung and in lymph nodes in chest and neck. It was found due to an x-ray for something else, no symptoms at all. I have had PET scan, CAT scan, x-ray, 3 biopsies one of which was an EBUS (endobronchial ultrasound). They came back as inconclusive, I will be going for another CAT scan this week, I have been offered only chemotherapy. My Mother was diagnosed very early. She lived 4 1/2 years after diagnosis which is practically unheard of. When diagnosed with lung cancer the patient range came 650 in CA125. In 2011 I was diagnosed with Bile Duct Cancer. Through radiation and chemotherapy that cancer was in remission. However a CT scan showed I had cancer in my lungs. If it were not for the CT scan I would not know I have cancer. At age 83 things are slowing down anyway. The last CT scan showed that the cancer is 4 centimeters and apparently growing. The Oncologist is starting me on a regimen of Flourouracil and oxaliplatin. We shall see how that works. My 73-year-old mom was diagnosed with stage four lung cancer recently. Five months ago, she had pneumonia and a little cough and started losing weight. She was a smoker in her teens and 20s but quit over 30 years ago. 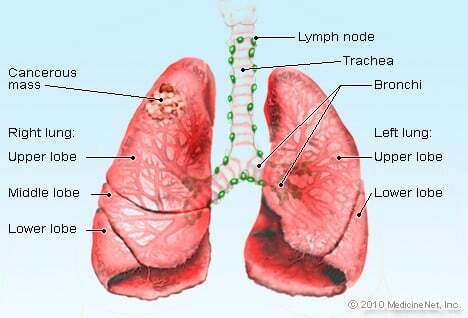 Non-small cell lung cancer, stage 4 - metastases to the liver.